Benin is a West African coastal country that is bordered by Togo, Nigeria, Burkina Faso and Niger. Malaria is endemic to the country and is the leading cause of mortality among children under five as well as the leading cause of morbitiy among adults. Rapid diagnostic testing, aretmisinin-based combination therapries (ACTs), and intermittent preventative treatment for pregnant women (IPTp) began in country in 2007 and has progressed with the support of the President’s Malaria Initiative (PMI) and other partners. Spray operators preparing their spray pumps in preperation for an IRS campaign in Benin. 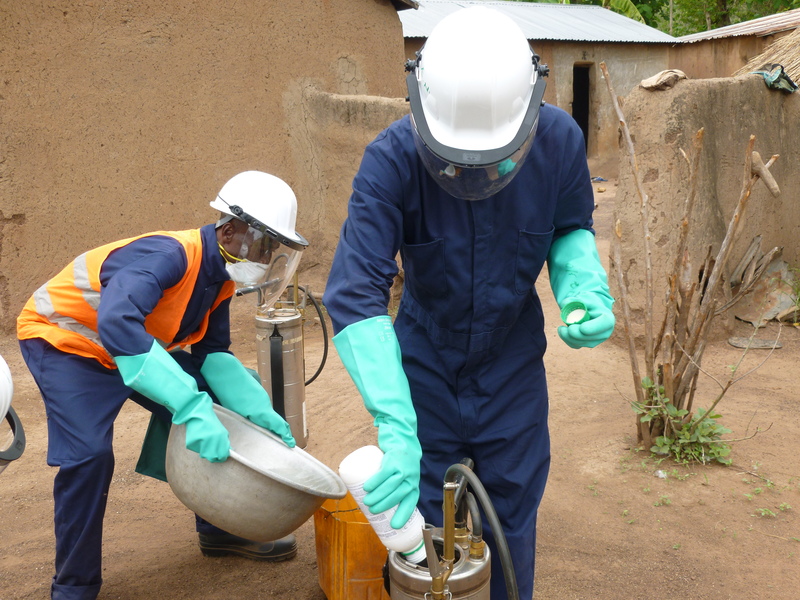 Since 2008, PMI has conducted indoor residual spraying (IRS) programs in Benin that have resulted in a significant reduction in malaria transmission across sprayed districts. IRS kills mosquitoes that trasnmit malaria by spraying insecticide on the walls, ceilings and other indoor resting places of those mosquitoes. Through a multi-faceted spray strategy, the PMI AIRS Project helped the Government of Benin to maintain it’s success in malaria control and invest in new areas to further protection. Building off of this great success, The PMI VectorLink Project is equipping Benin to plan and implement safe, cost-effective and sustainable IRS programs. PMI VectorLink will work with the Ministry of Health, the National Malaria Control Program, and other stakeholders in Benin to achieve at least 85 percent coverage. In 2018, PMI will support the spraying of approximately 432,379 structures among a number of communes in Benin.